A Vice.com story in June alleges that Broadband for America and other groups are astroturfing for broadband providers in the U.S. net neutrality debate. The recent coverage from news organizations has overwhelmingly targeted a lack of funding transparency in groups opposed to strong net neutrality regulations. Some of that coverage disparity may be because groups advocating for strong net neutrality rules tend to be more transparent about their funding than groups opposed, but some pro-net neutrality groups also have limited funding transparency mechanisms. Much of the reporting on so-called astroturfing has come from Vice.com, the news and culture website that has championed "immersionist" journalism. Vice is perhaps most famous for sending former Chicago Bulls basketball player Dennis Rodman to North Korea in early 2013. Other news organizations have written stories in recent months about a lack of funding transparency among groups active in other policy debates. In September, for example, The New York Times reported on foreign governments that allegedly buy influence at U.S. think tanks. In June, Vice.com connected advocacy group Broadband for America to the National Cable and Telecommunications Association, a trade group representing cable broadband providers, and the American Consumer Institute for Citizen Research to MyWireless.org, an arm of mobile trade group CTIA. Broadband for America, which has opposed strong net neutrality rules, had listed the NCTA as one of dozens of members, but the trade group paid for more than half of Broadband for America's budget, according to the story. At the time, Broadband for America listed the NCTA among its many members, although it didn't disclose how much money each member donated. The group's list of members has since disappeared from its website, although the NCTA remains a member of the group, a spokeswoman said. Days later, Vice.com again looked at Broadband for America and found that many small groups that were listed as members don't share the group's opposition to strong net neutrality rules. 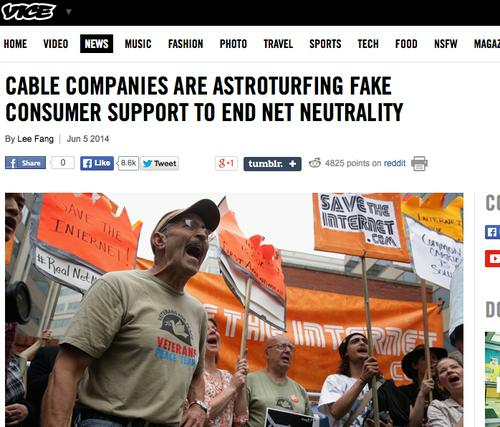 Pro-net neutrality tech news blog TechDirt then offered its own commentary. In July, TheNation.com and other sites published a blog post accusing many civil rights groups of "selling out" the Internet by opposing reclassification of broadband as a regulated utility. The blog post pointed to the Minority Media and Telecommunications Council, which receives money from broadband providers, as the organizer of the opposition. Also in July, Esquire.com pointed to connections between conservative think tank the American Enterprise Institute and Comcast, which opposes reclassification of broadband. AEI doesn't provide a complete list of donors on its website. In August, TechDirt reported that the July blog post run at TheNation.com and other sites was published, then taken down, at African-American news site NewsOne, whose parent company co-owns a cable TV service with Comcast. In August, MMTC responded to the reports in TheNation and TechDirt, saying the organization and other civil rights groups "receive funding from a variety of sources, and ... make their own decisions on policy issues." NewsOne took down the MMTC story because of questions about the story's content, the group suggested. Also in August, Vice.com examined lobbying firm DCI Group and its behind-the-scenes ties to opponents of broadband reclassification. The story looked at DCI's relationship to Politic365, a website focused on policies affecting racial minorities, and its parent organization, MMTC. In August, Vice.com's tech-focused Motherboard site called out conservative group American Commitment for failing to disclose its funding sources and for past connections to Republican billionaire brothers Charles and David Koch. In early October, ProPublica.org connected street campaign Onward Internet to cable trade group NCTA, saying the group "may be the latest stealth entrant in the increasingly nasty battle over net neutrality." The NCTA, first coy about its involvement with Onward Internet, later acknowledged it sponsored the campaign. However the street campaign, an NCTA spokesman said, was not focused on net neutrality, but on the broad benefits of the Internet. NCTA wanted people's unfiltered ideas about the future of the Internet, said NCTA spokesman Brian Dietz. The trade group wanted to "collect ideas from real individuals and we had to find a way to do it so that it that delivered unbiased opinions," he wrote in a blog post after the ProPublica story appeared. "So we decided to ask anonymously. We wanted to give people a chance to share their vision for the future without being swayed by the asker, leaving them free to express sincere ideas."